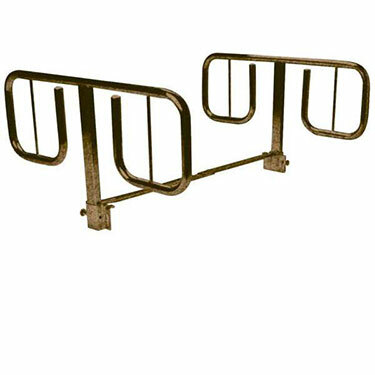 The half length T style bed rails by Drive Medical offer ideal maximum protection without confining the patient. They are for use with Pan-Style beds and bariatric beds (model #s: 15300, 15302 and 15303) from Drive Medical but will fit most manufacturer\'s hospital beds. They are constructed of 1" steel and feature and attractive brown vein finish. Protected by a manufacturers limited lifetime warranty. Dimensions of Rails: 31 L X 18.5 H X 3 W. These rails bolt on to the bed frame. Study but wish they were higher on the the bed . An adjustable heigth on the rails would be a plus.